Ashael Rising is a fun read. Part classic Fae fantasy and part light Science Fiction, this story hit all the notes of a high fantasy tale, but with a touch of modern sensibilities. The characters are well realized, and the world is rich, framing the story with a background of depth that adds subtle layers to every scene. At the heart of the story is a nature based society faced with the sudden return of powerful, ancient enemies long thought to have been vanquished. A community which cares about equality and honesty and constancy, must find a way to face one where power and a cruel social hierarchy hold sway. Healers and community leaders must find a way to stand against the threat without losing their own values and caring ways. These larger themes are brought close to the reader through the relationships and struggles of Ashael, her mentors and friends, especially the stranger who she comes to care for, who is more than he seems. Ashael must also come to terms with the fact that she too is more than she ever imagined, and accept the burden of her true nature and what it will mean for her people and herself. 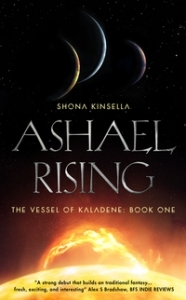 Well written and thoughtfully conceived, Ashael Rising is worth a look for anyone who enjoys high fantasy and new worlds. My only quibble is that the cover does not do the book justice. It has more of a ‘set in space’ feel, while the book is very earthy and grounded.